Break Da Bank Again was named the most popular video slot coming from Microgaming for several years in a row. It’s a sequel of an older classic slot game coming from this provider and it instantly became a big hit among Microgaming fans. The slot has a simple 9 pay line design, with low level animations and a slow game play. So why is Break Da Bank Again such a popular slot game? Well this is simply because the game has an amazing bonus round which can produce massive payouts. This is why many players try their luck on this slot across online casinos. The bonus features in the slot start with the wild symbol. The wild will substitute for all of the game symbols, except the scatter, and will add a x5 multiplier to all payouts he contributes in. The slot has a free spins bonus which is triggered with 3, 4 or 5 scatters on the reels and awards 15, 20 or 25 free spins accordingly. During the free spins each scatter which lands on the reels will award one extra free spin and all payouts will come with a x5 multiplier attached. This means that all wins with a wild in the bonus round will be multiplied by 25. Thanks to the high multiplier you just need one 5 of a kind win with a wild to walk away with a big payout on your account. 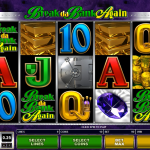 Break Da Bank Again is without a doubt a personal favorite for many Microgaming fans. The game doesn’t have great visual effects, but the payout potential certainly makes up for that. This is why you need to give Break Da Bank Again a try for real play and see what the slot has to offer. 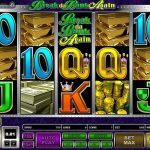 If you are in the mood for an engaging slot then you should consider playing Booty Time a 5 reel slot by MicroGaming.